The Case Club IWI Tavor Rifle Case is the best Tavor case on the market, bar none. 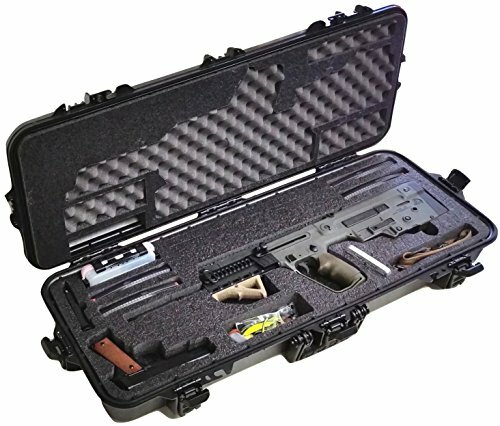 The precut foam will fit an X95, SAR, or TAR-21 rifle, rifle magazines, a full size or compact pistol, pistol magazines, a silica gel canister (included), waterproof accessory box (also included), & more in the generic accessory pocket. The foam can also accommodate optics and underbarrel attachments on the rifle, and underbarrel attachments on the pistol. The case itself is waterproof, dustproof, & has a built in pressure equalization valve for changing altitudes. It is heavy duty enough to ship or check on an airplane and can handle all the abuse from TSA agents. Five built in heavy duty latches ensure nothing gets in or out. Two latches are even keyed for extra security (set of keys included). Padlockable holes are also built right in, which can take standard sized Masterlocks so you can be guaranteed this case is safe & secure. The foam insert is closed cell military grade polyethylene which can be wiped clean if wet or oily. The foam is perforated above and below the main Tavor cutout so you can remove the foam (with included knife!) as needed to customize the insert for your unique optics and attachments. The pistol cutout is also perforated so a full size fits just as snug as a compact. The rifle magazine cutouts can hold either 10, 20 or 30 round regular or pmag magazines. Reusable silica gel canister is included to remove moisture from within the case. Once the silica gel is saturated just pop it in the oven to cook out the moisture & use it again. A waterproof accessory box is also included, and it is perfect for storing your cleaning supplies and small tools. The lid holds a foam combination of convoluted (egg crate) & closed cell polyethylene, specifically engineered to hold everything down perfectly. This case is compact, organized, & uses all available space to the fullest.